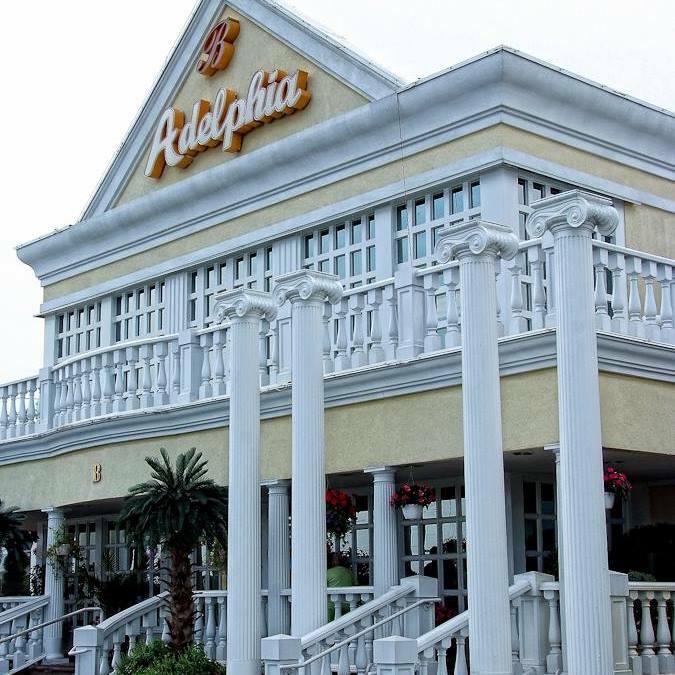 Adelphia Restaurant is a family-owned restaurant which has become a South New Jersey fixture with its extraordinary ambience and delectable cuisine. When it comes to nightlife and warm hospitality, Adelphia is a wonderful restaurant and night club to visit when you want to celebrate a special occasion or just relax over a meal and drinks with family or friends. Adelphia attracts a myriad of regulars who appreciate the opportunity to spend an enjoyable evening complemented by attentive service and delicious cuisine. 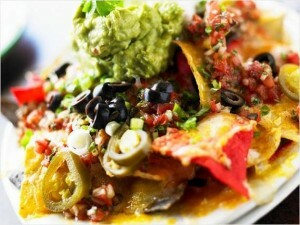 Aside from the casual yet elegant ambience of the restaurant, the food is the main draw for visitors. From gourmet burgers to artisan pizzas/flatbreads to steak, chop and seafood entrées, the restaurant menu is replete with savory options. At Adelphia, the Balis family, together with their highly trained chefs, consistently offer the finest in American Cuisine with a Mediterranean flair. And with an award-winning Sunday brunch, Adelphia Restaurant satisfies all tastes and palates. 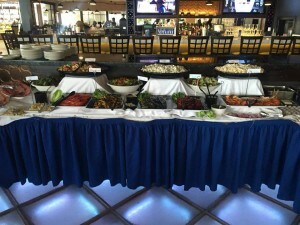 While the appetizer offerings at Adelphia include popular items like mozzarella sticks and boneless wings, you’ll also discover unique and flavorful bites like shrimp cocktail, fried feta, sesame-crusted ahi tuna, and the amazing mac and lobster. You’ll also enjoy an extraordinary array of soups and salads such as Avgolemole, a traditional Greek soup, and Clam Chowder. Fans of Adelphia rave about the Filet Mignon Vivaldi, the Chicken Bella, and the Cape May Salad featuring fresh scallops, shrimp, and crab atop fresh greens, and tossed with a tomato vinaigrette. If you’re visiting to enjoy a casual meal, consider ordering a specialty burger such as the spicy Habanero Burger or a flavor-rich sandwich like the Bayou Grilled Chicken Breast. Pizza aficionados can create their own masterpiece, or luxuriate in the gooey mozzarella, garlic and olive oil flavors of the restaurant’s White Pizza. If you’re in the mood for pasta, you’ll enjoy selections like Lobster Ravioli or Sicilian-style Penne. If meat or seafood is on your mind, consider the Lollipop Lamb Chops, Steak Alexander, Maryland Crab Cakes, or baked Cold Water Lobster Tail. 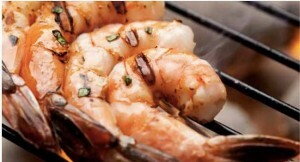 Whatever you decide, fresh ingredients and skilled preparations are assuredly the hallmarks of Adelphia’s cuisine. 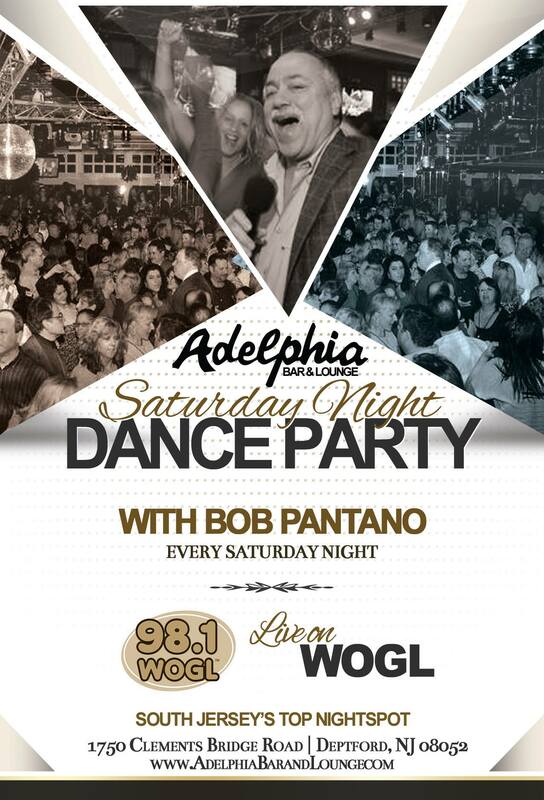 Once you’ve enjoyed a meal at Adelphia, pay a visit to the lounge and bar, which boasts a stellar nightlife and special live entertainment including, 15-piece Latin jazz band, Cintron, and the weekly Saturday Night Dance Party with celebrity host Bob Pantano. 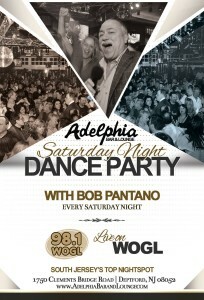 With specials throughout the year, including holiday parties and karaoke nights, Adelphia showcases the area’s top bands, DJs, radio broadcasts and dance parties. Fantastic happy hour and drink specials coupled with a relaxed atmosphere make this THE to-go spot any night of the week. Whether you want to watch a sports game with friends over a beer or two, hang out over cocktails with a special date, or dance the night away, the lounge at Adelphia has you covered. 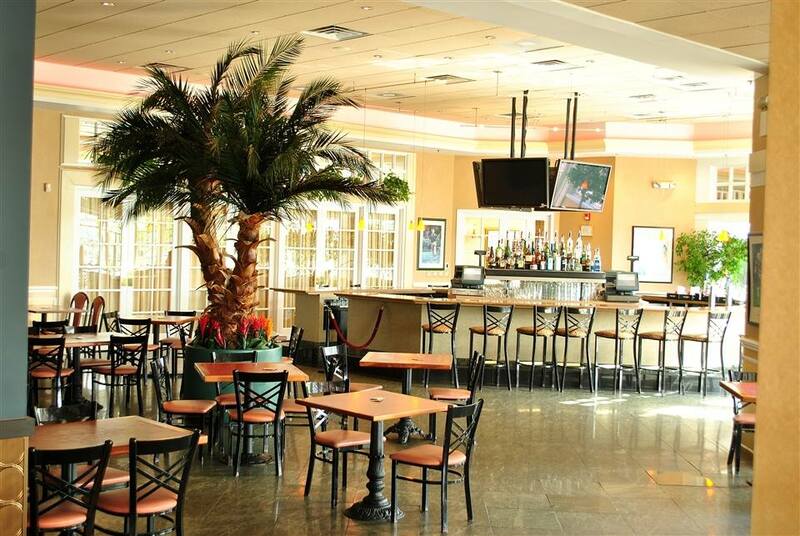 Adelphia Restaurant has also played host to countless bachelorette parties, bridal and baby showers, graduation parties, weddings and more. Adelphia’s banquet rooms, can accommodate groups as large as 500 guests. They also cater off-site events, so if you’re in need of feeding a large group of people and want to serve delicious, mouthwatering fare, Adelphia is the regional catering favorite. 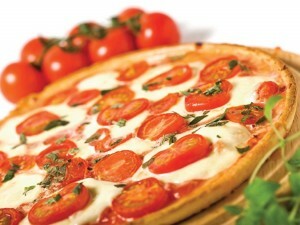 They’re happy to create a menu specifically designed for your catering needs. Adelphia Restaurant has proven that it is possible to successfully blend fine cuisine and an elegant atmosphere with a vibrant and wildly popular lounge which consistently attracts a diverse clientele. Please visit Adelphia Restaurant and witness for yourself why this New Jersey ‘jewel’ is revered for its attractive setting, friendly staff, and world-class cuisine. Follow Adelphia Restaurant on Facebook. Visit Adelphia Restaurant’s official website. 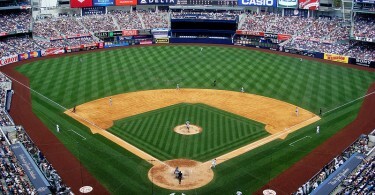 From what I have read here, this is the place to be. Good food and good entertainment combined. Great stuff. Last night, I enjoyed attending the fundraiser for Dennis Burke (RIP) held at this beautiful place. I saw many of the entertainers from Hooked on Entertainment participating in the celebrations. Starting with Bob Pantano and Lou Costello from 98.1 and 92.1, respectively. First Ladies of Rock & Soul performed and then came entertainer after entertainer. Joey M from La Piazza Restaurant in Wildwood, NJ sang as well as Lou (the shoe) Porecca, to everyone’s pleasure Jimmy Lee sang, Kenny Jeremiah sang Hero and Get Up Get Down Get Funky Get Loose and told of his long standing radio hour on Tuesday nights with Pepper Paul that he would always play that at his last song. Tommy McCarthy was called up to speak for his long time friendship with Dennis Burke. Many other artists were there in the crowd, there was Greg Martiello, Vic Rubino, Greg Armstrong and Frankie (Dinner with Diamond) Derosa. Bobby Beato’s band of Purple Reign also performed, Jimmy Lee sang a couple of hits, the original band of Soul Survivors also performed and then asked Kenny Jeremiah to sing Expressway to Your Heart with them, which was the first hit for Gamble and Huff which ushered in The Sound of Philly (TSOP). My favorite opera singers were Mike Jones and Marc Antonelli (Sal Dupree trained) and they sang a duet that had everyone in awe. Each had a chance to sing a solo as well. I was able to video Holly Faris as she paid tribute to Tina Turner. Finally the show stopper was when Patti Lattanzi & Billy Carlucci came out and sang their notorious opening number for their radio show which includes Dennis Burke’s name in the lyrics. Wow! I am sure a lot of money was raised and on top of all that Bob Pantano personally invited the Burke family to call him if they ever have a need. Wow! The man who I admired the most for his acts of servitude was Bill Balis, owner of the Adelphia Restaurant; he worked tirelessly serving and making sure everyone was served in good time until the end of the night, where he could still be seen helping the staff to break down and put away tables, etc. Wow! Two thumbs up! Thank you Shannon!!! Bill’s main goal is to make his customers happy and help the staff whenever possible. 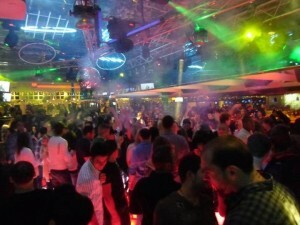 We are glad you enjoyed the event and hope to see you soon!